Dalstrong Chef Knife 8″ – VG10 Hammered Finish | The Perfect Steak Co. | The Perfect Steak Co. 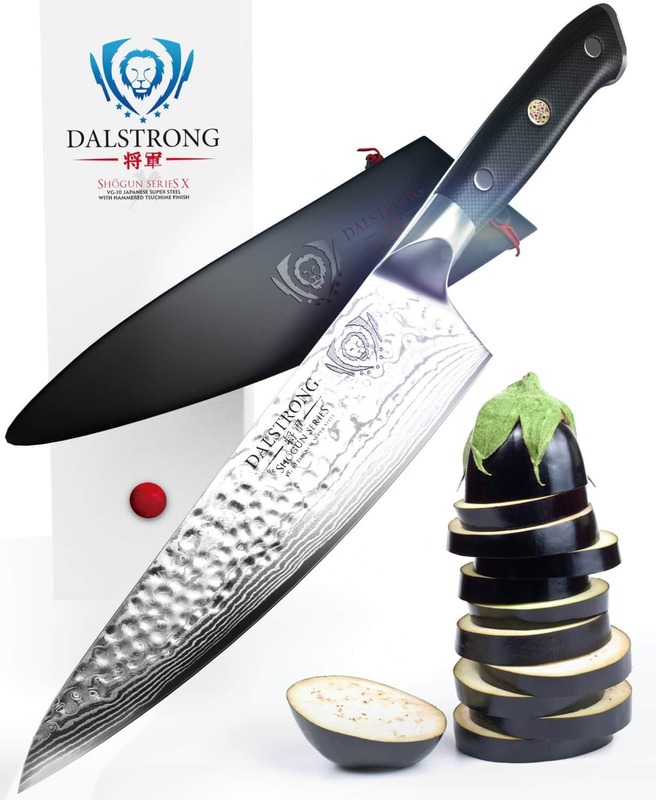 The Dalstrong Shogun Series X chef knife is painstakingly crafted over 60 days using the highest quality materials, it is both a razor-sharp kitchen powerhouse and artistic statement in premium design and workmanship unrivalled in performance, beauty and value. 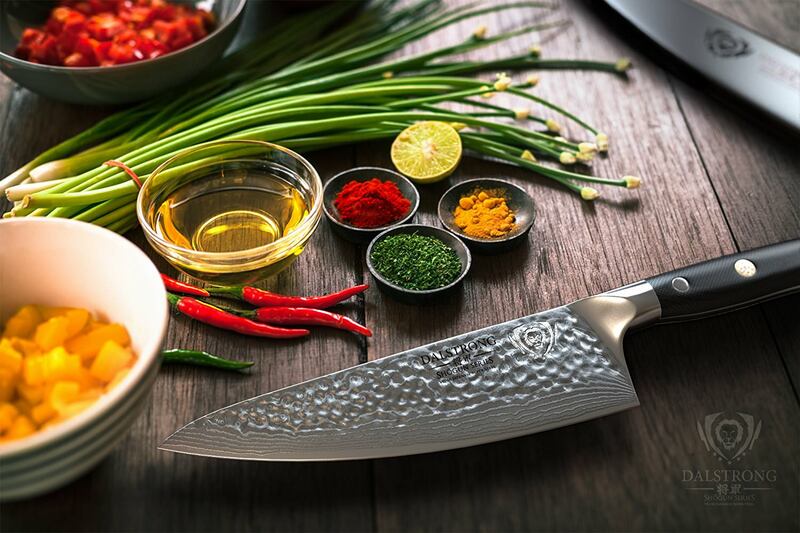 Painstakingly crafted over 60 days using the highest quality materials, the Shogun Series X chef knife is both a versatile, razor-sharp kitchen powerhouse and artistic statement in premium design and workmanship. 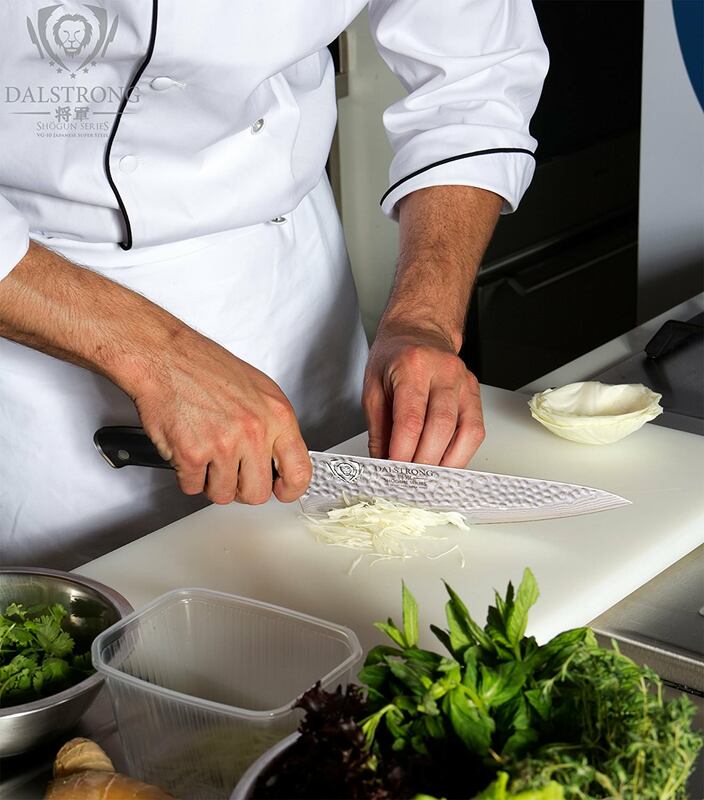 Dalstrong Power: This chef knife features an ultra sharp VG-10 Japanese super steel cutting core at 62+ Rockwell hardness: extraordinary performance and edge retention. 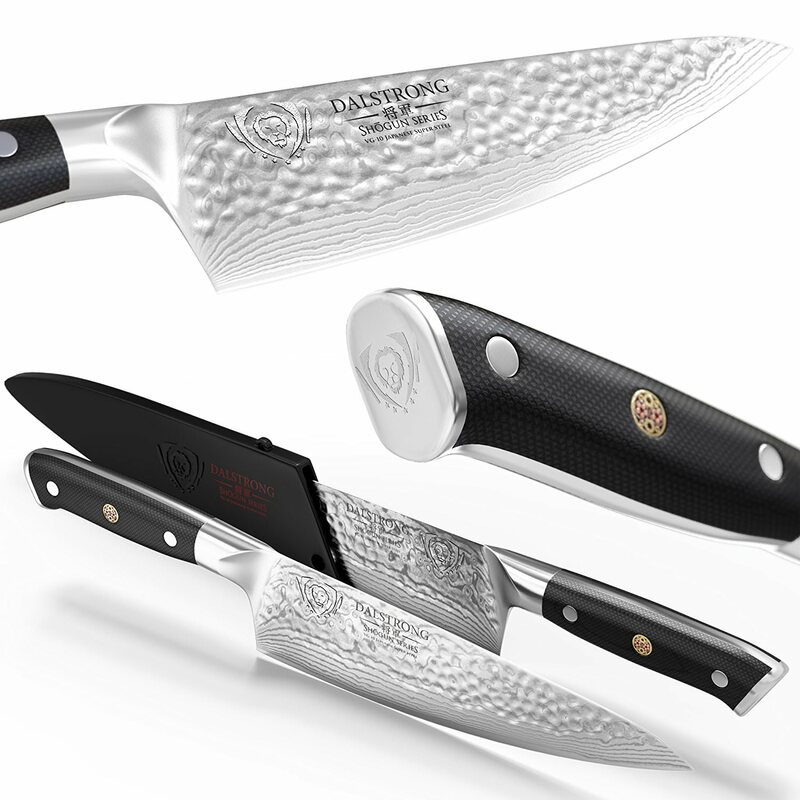 66 layers of premium high-carbon stainless steel layers ensure exceptional strength, durability and stain resistance. Perfectly balanced. Dalstrong’s stunning ‘tsunami-rose’ genuine Damascus layers. 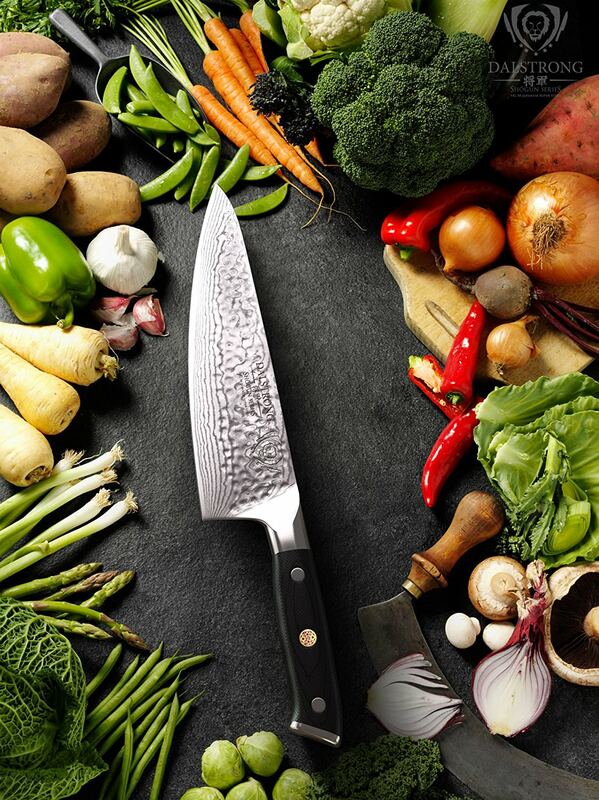 A Chef’s Knife Engineered to Perfection: Ultra-premium G-10 handle is military grade with life-long durability. Hand polished, the ergonomic handle shape is engineered for superior control, agility and comfort while the blade’s spine is made smooth for a natural ‘pinch grip’. The 55mm blade width allows for improved knuckle clearance. Forged with the utmost precision, a single piece of ultra premium Japanese VG-10 super steel is carefully cladded by high-carbon SUS410 stainless steel folded over repeatedly and hand polished to reveal the breathtaking Dalstrong ‘Tsunami Rose’ pattern. This further ensures corrosion and stain resistance, allowing for a blade of exceptional beauty, yet low maintenance. The Shogun Series X exquisite hammered tsuchime finish is not only beautiful but reduces drag . 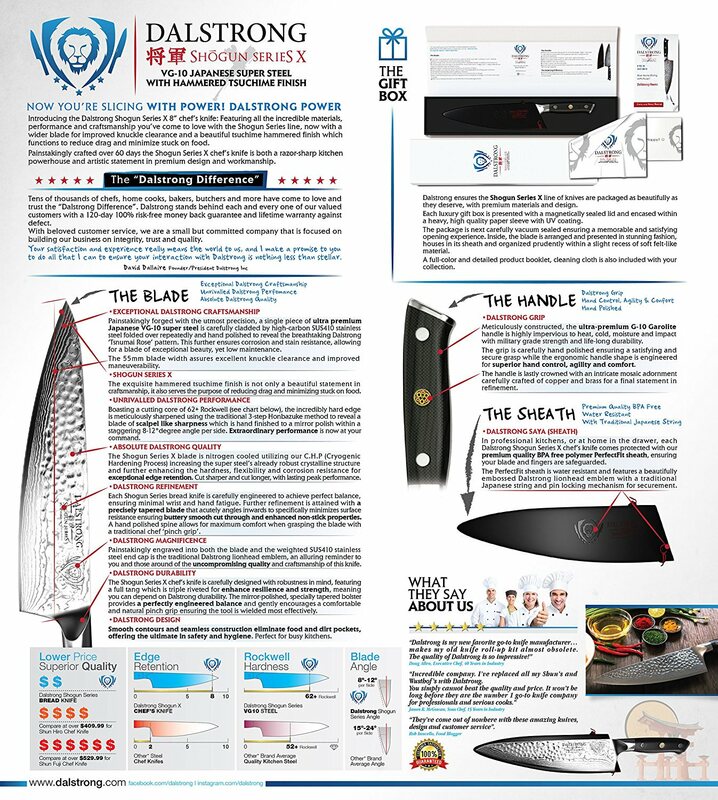 Boasting a cutting core of 62+ Rockwell the incredibly hard edge is meticulously sharpened using the traditional 3-step Honbazuke method to reveal a blade of scalpel like sharpness which is hand finished to a mirror polish within a staggering 8-12°degree angle per side. Extraordinary performance is now at your command. Slice, cut, mince and dice with gratifying efficiency.